STUTTGART: Karolina Pliskova recovered from a slow start to beat CoCo Vandeweghe 7-6 (7/2), 6-4 and claim the Stuttgart Grand Prix title yesterday. 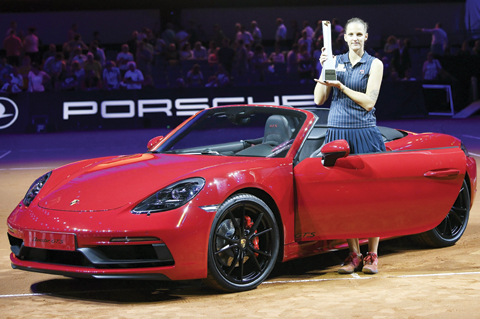 The Czech fifth seed earned the second clay trophy of her career after Prague three years ago. She was the first from her country to play in the German final. Vandeweghe had won three of their four previous meetings, but lost to the Czech in the Stuttgart second round a year ago. The American had not dropped serve in her two wins prior to the final. On Sunday, Pliskova broke three times in a one and three-quarter hour victory. Vandeweghe started by breaking Pliskova in the opening game before the Czech found her rhythm to break back in the fourth game. The set then tightened with both women relinquishing little on serve. In the tiebreaker, Vandeweghe again jumped into an early lead. But Pliskova won six consecutive points and earned three set points from a second-serve ace.